Within a couple of hours, I was struck three times. Actually, sideswiped was more like it. But with a flurry of drops still leaving their mark. 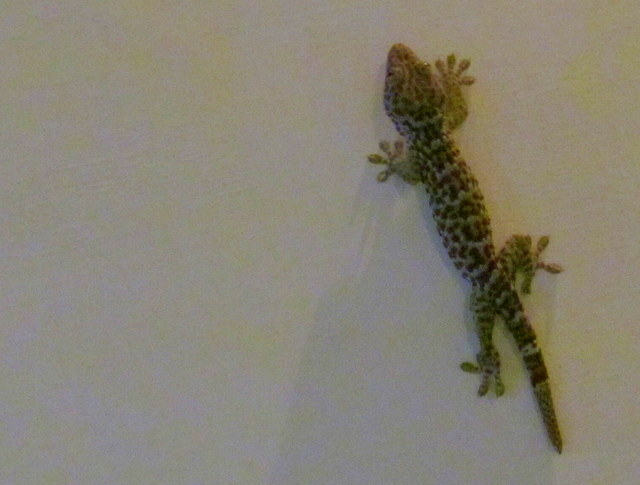 What I’m referring to is the almighty Pee ‘n Poop; the stuff that Balinese geckos – cecak and the larger tokek – love to shower down on unsuspecting human beings, as they stealthily wriggle and sniggle above us on ceilings. I’ve never been struck by these creatures’ little streams and micro mud-piles before. There’s always a first. And maybe a second, etc. But here’s the thing: I was targeted (intentionally or not) THREE times. They say that being rained on by gecko poop is a sign of luck. An auspicious sign. My guess is that I’ve just been thrice blessed by the gods. How lucky can one get?! Maybe this solves my mystery. I was sleeping soundly. Suddenly I was awake and was certain that someone had splashed water on my left cheek. I was so tired, and a little scared, so I didn’t reach up and feel it, didn’t wipe it off, just pretended it didn’t happen and feel immediately back to sleep. Could that have been a gecko? I believe, m’lady, that you’ve been cecaked! I have been peed/pooped on in Bali 3 times now in 3 days! Strange! That kind of good luck I can do without!